The Bronx, Australia's favourite LA punk band, are back with their first album in five years, IV. Produced by Beau Burchell, IV marks the 10 year anniversary of the band and will see the band return to Australia this April to share it with fans all around the country on their most extensive national tour ever. Already announced as part of the national Groovin the Moo festival line up (gtm.net.au), we are delighted to now announce capital city headline shows nationally. 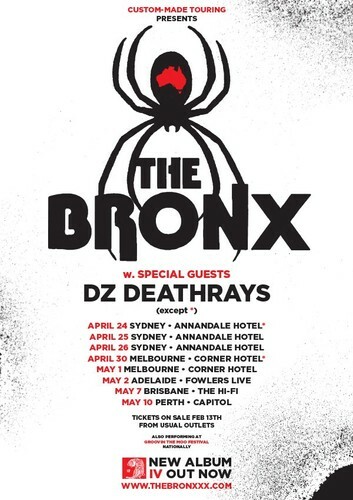 Sydney & Melbourne fans will be treated to special, intimate shows for their 2013 Bronx experience as the band return to their roots to perform in venues they played early in their career. Along for the ride for the show will be the amazing Dz Deathrays. DZ Deathrays are an ARIA Award winning Brisbane indie/thrash/punk 2-piece that have been creating a stir on the international scene over the past 2 year, culminating in the release of their debut LP, 'Bloodstreams'. They've toured the globe, performing various sold out shows in London and New York and stadium shows in Australia with the Foo Fighters. They've received multiple accolades in the media, with 'Bloodstreams' receiving a 7.4/10 rating from Pitchfork, 9/10 rating from NME, and NME placing them #4 in the 20 Most Exciting Bands of 2012. They were also given 'Next Hype' by Zane Lowe of BBC1 and featured Arj Barker in the film clip for their single 'No Sleep'. They finished 2012 on top, winning an ARIA for Best Hard Rock / Heavy Metal Album.